If you're looking for a fun & easy gift for a friend's baby shower or to welcome a new baby boy, I have the project for you! I purchased this outfit at my local Target store, added a few stamped images and some buttons and I was done. I just love projects that I can create in just a short amount of time! Wouldn't this little outfit make a great gift for that little boy in your life? Stay tuned to next week and I'll share with you a birthday scrapbook album that is perfect for a little guys first birthday! I'll also share a sweet outfit for a little girl that didn't take hardly any time to make. And speaking of baby outfits, don't forget to check out the newest issue of Scrap & Stamp Arts magazine. On page 25 you'll find my Pirate Princess Baby Outfit that I designed. I guess with my new granddaughter, I have babies on the brain!!! Designer Note~For All Fabric Stamped Projects: Before stamping any outfit, be sure to wash the outfit first without fabric softener. 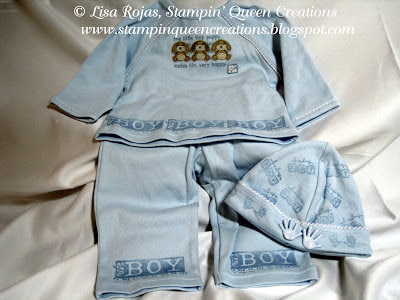 After stamping, heat set outfit with an iron or the dryer. Wash outfit by turning it inside-out on a gentle cycle. Step 1. Using Baby Blue inkpad, stamp “Oh Boy” three times on the bottom of the shirt and once on each leg. Step 2. Stamp “Baby Boy” randomly on hat with blue inkpad. Stamp handprints along the edge of hat. Step 3. With needle and thread, sew buttons on front center of hat. Place outfit in dryer for 15 to 20 minutes to heat set ink.